4 Eb 1 1st fretfr. 3 A 3 2nd fretfr. 2 C 2 1st fretfr. 1 F# 4 2nd fretfr. Chord Adim7 notes: A, Eb, A, C and F#. You should not play the 6th string. The string 5 (A) is left open. 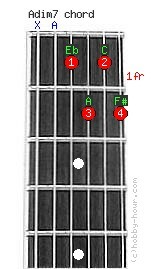 Adim7 - A diminished seventh guitar chord's alternative names: A°, A°7, Ao7, A7dim. See also: Adim and Am7b5.